**This post was written for AD FS 2.0 running on Windows Server 2008 or Windows Server 2008 R2. For information on uninstalling and cleaning up AD FS 2.1 on Windows Server 2012 please see the post Uninstalling AD FS in Windows Server 2012. I’ve been working on an installation guide for AD FS 2.0 and have needed to uninstall and reinstall several times. When you uninstall AD FS the database isn’t deleted. The IIS applications aren’t removed and the token signing objects in AD DS aren’t removed. Microsoft Support knowledgebase article kb982813 How to restore IIS and clean up Active Directory when you uninstall Active Directory Federation Services 2.0 describes how to remove the AD DS objects and the IIS applications and virtual directories but does not explain how to remove the AD FS database. This isn’t a major problem as the FsConfig.exe configuration tool has a /cleanconfig switch that will drop and create new databases however when you’re developing guidance for others you can’t really use the CLEAN switch and therefore need to be able to effectively remove the database. The following instructions explain how to do this. 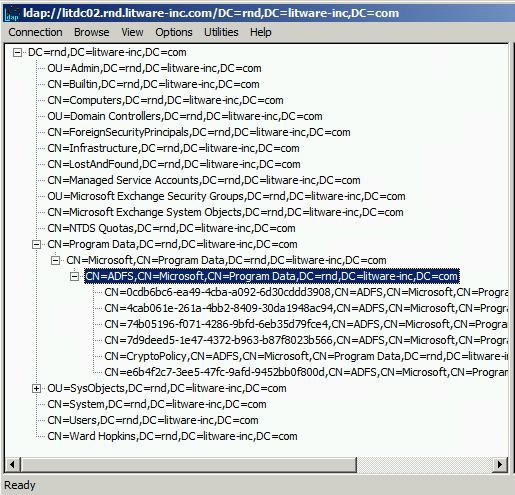 AD FS 2.0: Migrate Your AD FS Configuration Database to SQL Server was the guiding factor in putting this post together. Here’s what I had to do and did. If you are following these instructions and still have a working AD FS skim down to the clean up AD DS section and perform those steps first. Click View Installed Updates and type ACTIVE into the Search Programs and Features search bar. Select Active Directory Federation Services 2.0 and click Uninstall. Downloaded and installed SQL Server 2008 R2 Express Management Tools. Lastly, you can remove WID using Server Manager, e.g. Right-click on adfs and click RemoveBe sure to remove LS and then ADFS and don’t just remove ADFS otherwise you’ll be in the applicationHost.config deleting XML elements. Which gives you the DN, e.g. But more often than not we read the instructions last. So we need to delete the container with a CN of the GUID of your AD FS farm from CN=Microsoft, CN=Program Data, DC=your-domain, DC=tld. In the case of the above picture I’ve stood up and torn down five AD FS farms. All of these certificate sharing containers need to go. But you need to be careful here. Please be sure there aren’t other active AD FS farms in the domain before you delete them! And regarding deleting, I’m a big user of LDP but also like PowerShell and often don’t have access to ADWS (Active Directory Web Services) so here’s a little snippet for delete using S.DS (System.DirectoryServices). At this point all should be removed and all well. If you deleted the ADFS application before you deleted the LS application read on. I hope this post has been helpful! If you got the order wrong and you get the error: “Application pool ‘ADFSAppPool’ cannot be deleted because it contains 1 applications.” (dialog below) you need to perform the following steps. Open an elevated notepad and then open C:\Windows\system32\inetsrv\config\applicationHost.config. Search for adfs/ls and then delete the selected element below. Save the file and you’ll be able to remove the application pool from IIS. This entry was posted in AD FS and tagged Active Directory Federation Services, Active Directory Federation Services 2.0, AD FS, AD FS 2.0, Tip, Troubleshooting. Bookmark the permalink. I am nota ble to connect to this path using SSMS.How to find the corresponding instance of my server where ADFS 2.0 is installed. Are you using an elevated SQL Server Management Studio (SSMS) instance, i.e. did you open SSMS by right-clicking and choosing run as administrator? By default only members of the administrators group can access the database instance. I am using SSMS.I need to know to which server and databse i need to connect to execute the query that is mentioned in step 3 and click Uninstall. How can i connect to my instance of Windows Internal DB.How can i know the path. The listed path is the path to the local WID instance. You need to open an elevated SSMS and then connect to the described path (\\.\pipe\MSSQL$MICROSOFT##SSEE\sql\query). If that isn’t working the next question is are you sure you were using WID? If you open SQL Server Configuration Manager you can see whether or not there is a WID instance running on the host and you can start and stop it among other things. You should also see that only the Shared Memory protocol is enabled. Pingback: Uninstalling An ADFS v2.0 STS Server « Jorge's Quest For Knowledge! This is the best AD FS 2.0 uninstall guide I’ve seen so far. Thanks a lot for publishing. Nice work really, and I wonder if there is a way other than uninstalling if I want to move back from SQL database to WID. Why? Because of the licensing issue. The ADFS setup is being moved to different physical location where SQL servers do not exist and we need to make it redundant using the WID. There’s no migration from SQL –> WID that I know of. In your case you have to just plan to migrate the environment. Export the AD FS server and trust configuration using PowerShell. While the original system is still online build a new farm using WID and import the configuration and rules. Validate locally (HOST files or private, local DNS) and then switch DNS over to the new farm and decommission the old after a few days of the new environment running. When I speak to customers about AD FS design I always push for a WID-based deployment. I’ve yet to work with a customer that actually needed SQL, although at least two did implement it. Unfortunately there’s a mentality that the bigger, better, more expensive SQL is an enterprise option, which isn’t strictly true in this case as WID gives you far more availability and flexibility at a fraction of the cost. The flow of the article is in a reactive voice, i.e. here’s what I did and why. I expect someone to read a set of instructions before executing them. What if you get half way through and there’s something you don’t trust or are unable to do without raising an additional change or needing more permissions from another area of the business? ok since some of us followed the steps right away without reading, how do we go about the “Clean AD DS” step now. i understand u humored the followers of this article in a twisted way. but now since its done, how to proceed? How many farms do you have? If just one, then delete the lot; if more than one you need to identify which is which. Are you in this position? In one of the case i don’t see /adfs/fs virtual directory. any idea on how to create the virtual directory without re-configuring the complete ADFS services. It is configured on Windows 2012 standard edition. Can you please describe the scenario here? The configuration wizard will recreate/redeploy the adfs virtual directory *if* you haven’t customised it. If you have I don’t know of a quick switch to do this and would look at exporting configuration and then reinstalling. Thank you Paul, your this over two years ago, and as luck would have it, it’s exactly what I needed today. Great post! This is what I’m looking for. I’m just having an error when I execute the Add-PSSnapin microsoft.adfs.powershell. Add-PSSnapin : The Windows PowerShell snap-in ‘Microsoft.Adfs.PowerShell’ is not installed on this computer. Above is exactly what I am getting. Hope you could help me on this. Two thoughts – (1) You’ve uninstalled AD FS therefore the snap-in is no longer installed and thus unavailable; (2) you’re on a Windows Server 2012 R2 server in which case there is now a module (as opposed to a snap-in) which PowerShell will automatically load, so just go to the 2012 R2 post (link at the top) and run the cmdlet. Thanks Paul. I’ve saw that one which I also use as a guide. Got it already. Can the CN=CryptoPolicy be removed as well? It’s a child of the ADFS-owned/managed node, so yes if you are cleaning up. Be mindful that you shouldn’t delete it if there are active WID farms using auto-cert rollover, i.e. if you are removing one installation but there are others that are active then best not to if they are using them. Thank you, Paul. This was our only ADFS WID. Worked very well – thank you !